Google AdSense इस planet का अभी तक सबसे बढ़िया ad program है. चाहे, इसके बहुत सारे alternatives हैं, लेकिन innovation, user-friendliness और overall experience के terms में अभी तक इससे बढ़िया कोई भी अन्य competitor perform नहीं कर पाया है. February 21, 2018 को AdSense की team ने Google Auto ads को सभी के लिए launch कर दिया था. ये हाल के time में AdSense की team के द्वारा की गयी one of the biggest innovation है. यहाँ तक कि Auto ads आपका नजरिया बदल देंगी जिस हिसाब से आप AdSense को use करते रहे हैं. 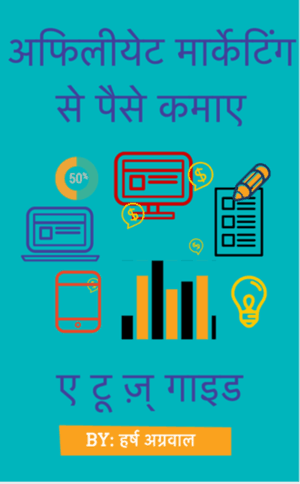 ज़्यादातर AdSense publishers के biggest concerns में से है, ad placement, ad optimization और एक बढ़िया user-experience बनाये रखना. Global Settings: ads कब display हों. Domain-based setting: इस चीज़ को configure कीजिये की कौनसे domain या subdomain पर कौनसी ads show हों. Directory Settings: आप इस चीज़ को configure कर सकते हैं की किसी एक particular directory में किस तरह की ads show हों. Example के लिए, pagination वाले pages और archive वाले pages में, आप चाहेंगे कि matched content वाली ads show न हों, तो आप इस चीज़ को AdSense के settings panel से control कर सकते हैं. इस feature को Advanced URL settings के नाम से जाना जाता है. आप इसके बारे में अधिक यहाँ से जान सकते हैं. Auto ads के बारे में अभी तक हमें users से mixed reviews ही मिलें हैं. फिर भी main AdSense के Auto ads के भविष्य को लेकर आशावादी हूँ क्योंकि ये publisher के सर से ad optimization का भोझ हल्का कर देंगी और blogger केवल बढ़िया content build करने में अपना सारा ध्यान लगा पायेगा. Google AdSense हमेशा से ही एक plug and play program रहा है, पर अब ये completely automatic हो गया है. इसका श्रेय Artificial Intelligence को जाता है. 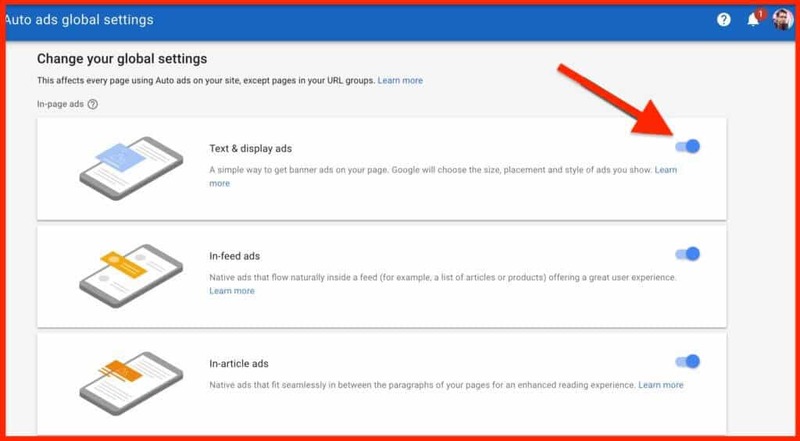 जिस किसी ने भी कभी Google AdSense को use किया है, उसके लिए Auto Ads बिलकुल भी एक समस्या नहीं है. फिर भी, Auto-ads को use करने से पहले, कुछ चीज़ें है जोकि आपको जाननी चाहिए. ये आपके उन प्रश्नों का उत्तर दे देंगी जो आपके मन में इसकी integration को लेकर हैं. यदि आपने अपने ब्लॉग पर already AdSense ads को लगाया हुआ है, आप decide कर सकते हैं कि आप उन्हें अभी remove नहीं करना चाहते. 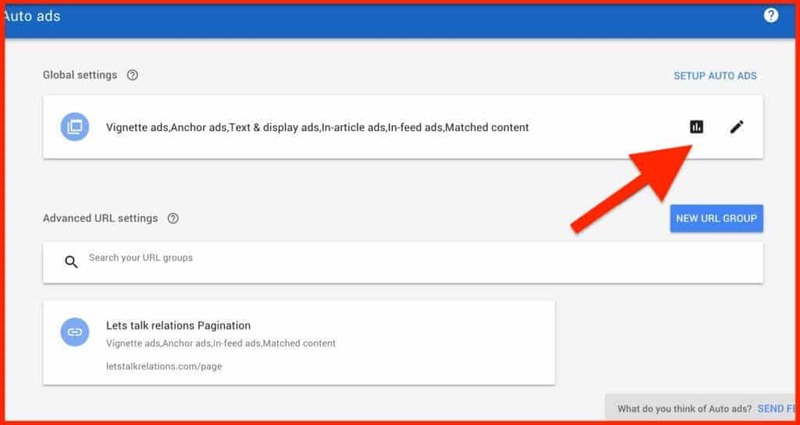 AdSense Auto ads automatically ही उन्हें detect कर लेंगी, और अधिक ads उस हिसाब से display करेंगी. क्या आप already Anchor या Vignette ads use कर रहें हैं? AutoAds में Anchor और Vignette ads included हैं और इसके साथ-साथ Text और display ads, In-feed और Matched content ads भी शामिल हैं. इस बात को note कीजिये की सभी users जोकि Page-level ads को use करते हैं, किसी भी code को add किये जाने की आवश्यकता के बिना, Auto ads पर migrate कर दिए जायेंगे. फिर भी अपने AdSense account में login करके Auto-ads के लिए Global settings को set करना एक बढ़िया idea होगा. 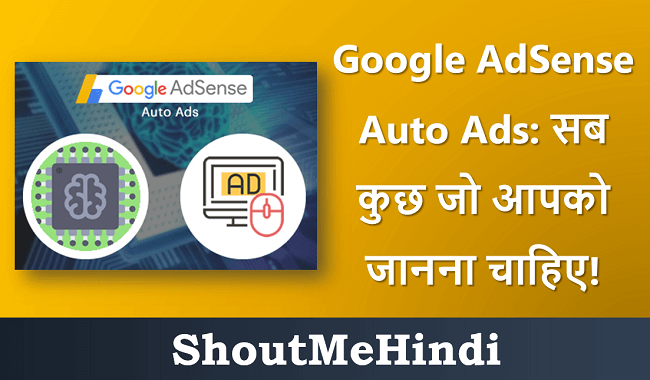 Google AdSense Auto Ads को कैसे enable करें? Ads > Auto Ads में जाईये. ‘Setup Auto Ads’ पर क्लिक कीजिये. Global settings को configure कीजिये. Enabling automatically करके नीचे नए formats आ जायेंगे. फिर save पर क्लिक कीजिये. अब ad codes को अपने blog या website के हर एक page में लगाईये. हम इसके लिए Google tag manager का प्रयोग करते हैं. आप अपने लिए किसी भी बढ़िया technique का प्रयोग कर सकते हैं. यदि आप already page level ads को use कर रहें हैं, तो आपको कुछ भी करने की ज़रुरत नहीं है. आप हमेशा Google Auto ads की performance को My Ads > Auto ads में जाकर और Statistics में जाकर check कर सकते हैं. Overall ये देखना बड़ा मजेदार होगा की Google Auto Ads future में कैसे काम कटे हैं. अभी तक, हमें इसके बारे में Mixed reviews ही मिल रहें है. कुछ लोग compalint कर रहे हैं की उन्हें ये system ज्यादा ads दिखा रहा है. पर जैसा की मैंने पहले खा, समय के साथ ये कुछ ऐसा है जिसे सभी को adapt करना होगा, तो जैसे कि ये system machine learning को use करता है, ये समय के साथ अपने आप बेहतर होगा. हमें AdSense auto-ads के साथ अपना experience बताईये. क्या आपने इसे अभी implement किया है या नहीं? 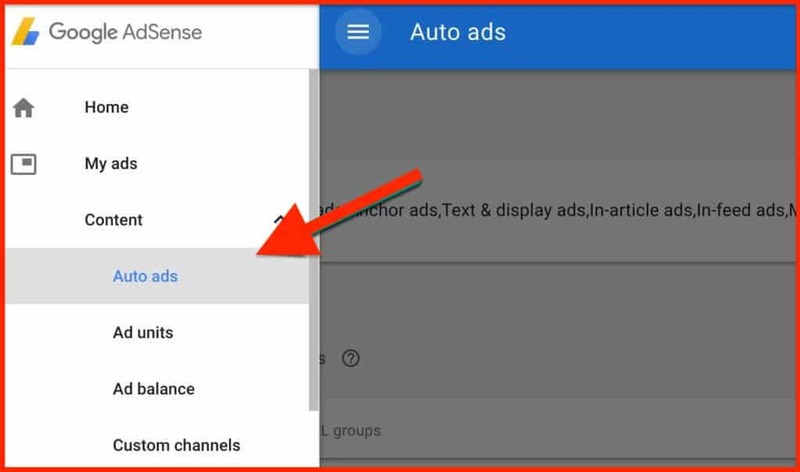 1.1 Google AdSense Auto Ads को कैसे enable करें? Sir ek website owner meri post copy kar raha hai, jaise title, parmalink aur 80, 90% content. Wo uski post me thida sa change kar deta hai. To mujhe kya karana chahiye. Usko warn bhi kiya lekin tabh bhi nahi chod raha. kaun copy kr rha hai? give link. Bahut badhiya jankari di gayi hai. Hello Gurmeet Sir, mera AdSense, badi mehnat aur patience ke bad just abhi thode din pahle hi approve hua h(feeling happy for that) aur me blogger Platform use karta hu.. to mere sawal aapse hai ki..
2) Me bahut confuse hu ki konsa ad format kaha lagau? Random results for everyone. Let’s see what happens further. (1) sir kya main multiple blogs(platform blogger) ek hi adsense a/c se connecte kr sakta hun. (2) agar unme se koi ek blog invallid click ke karan ban hota hai to kya dushare blog ki earning bhi stop ho jayegi aur wo bhi ban mana jayeaga. Thank so much Gurmeet sir. Sir Kya Google Adsense Par Ek E-Mail Se 2 Account Bana Sakte Hai?? main ne Adsense ka Auto Ads. opt kiya that 4 din phale. Phale to main bhot khush ( Happy ) hua ki ads aapne aap aa rahe hai or ek post me 5-6 ads tak aa rahe hai. Par 2 din se se maine ek baat notice ki hai ki mera CPC rate bhot kam ho gya kal mera CPC .03 $ tha or aaj .01 $, jabki ads click 5-9 tak aarahe hai. Mera CPC kabhi bhi .04 $ se nice nahi gya that or kabhi kabhi to .08 $ tak bhi gya hai. Aap Please mujhe bataye ki Kya kisi or ko bhi lagta hai ki Auto ads aap ki CPC ko kam kar raha hai ??? Nahi nahi, vo Autoads ke kaarn nahi hai. Normally hoga.